Feed the beast. Created for Ludum Dare 37 in 72 hours. HINT: Press the food machine button a second time when its light comes on to create food. I enjoyed this quick little game! I think the creature is super cool and would have loved to seen him do more! I'm a little curious why he spits stars into the universe, but cool none the less. I really wanted to see him crawl out of the cage and be with you or eat you or something, but what ever that little alien slug man is doing out there, he's a good boy ahaha. I'd love to see an updated version of this with a little bit more in it, but it was still fun for a fast play! This game was intresting! The puzzle was alittle complex but once you figure it out it does get much better!! Great design with the BEAST! Below is my video! after the use of the first food item the game comes to a stop, i use the machine as the hint suggested and fooled around with various timed clicks during its sequence yet no other food is presented causing me to quit and try again with the same results :p cool game though its interesting for sure. I love this. It looks scary at first but when you look at its face... Its kinda cute in its own way! I love this. Cant wait to see more of this! NICE GAME! Cant wait for the full game! it has SOOOOOO much potential! This game just left me giddy with the potential it has. I want to see more, I want to know more! 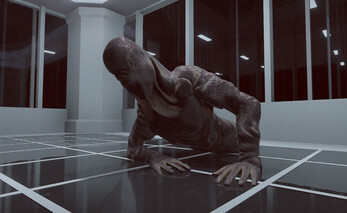 Also the creature in the cage was not only creepy, but one of the best rendered I've seen in an indie project. It was interesting to see the monster evolve. Thought it was gonna get me. Looking forward to seeing more of this. Great simulator! It was like Tamagotchi, but demented. I wished it was a bit more fleshed out, perhaps with some monster toys to give him, or maybe meat or something to feed him with instead. Something to make 'caring' a little less monotonous. I understand it was for a Ludum jam though, so you can only do so much with the time! I thought you did great, I enjoyed this brief little experience. Hope you enjoy the vid! 100% visual youtube channel!? That's Lumps Plays! This is mindblowing. Not because of the ending. But because this is not a game at all. When I finally got my bubblegum candybar thing through the hole, my globulo-monstah guy seemed happy I fed him. I couldn't get any more food out of the machine. I clicked the light button about 20 times. Stupid machine. I came this close to kicking it but realized I had no legs.